For many years I have wanted to visit the Vegfest UK shows www.vegfest.co.uk in Bristol and Brighton to see the latest free from foods, so it was great news to learn that the first ever show arrived in London on 5th and 6th October. When Ray and I visited, we discovered it was more of a lifestyle show than a food exhibition displaying everything from vegan shoes and bags to promoting charities and good causes. Ray was excited to find out that all food items were dairy free, although I was careful to check whether they were gluten free as well. Our first stop was Freedom Mallow www.freefrommallows.com to sample its delicious dairy free marshmallows, which are sweet, light and fluffy and gelatine free. Ray described the vanilla variety as “awesome. They dissolve in your mouth – they aren’t chewy which is good”. We met David Lavelle and Louise Mark who gave us samples of the new strawberry flavour (just as tasty as the vanilla variety) and new 1000g catering packs of mini marshmallows. We met Aneeh Popat, aka The Chocolatier www.the-chocolatier.co.uk and sampled his melt in the mouth Dark Salted Caramel Chocolate Spread (£7.95 a jar), dairy and gluten free, which can be used as a spread on toast – or simply eaten straight from the jar! 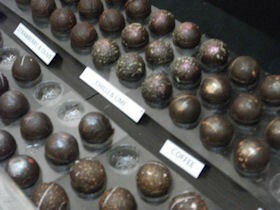 An awesome collection of dairy free truffles were on display including his signature chilli and lime flavour. “3 Omega 6” www.3omega6.com is a new dairy free flax drink made from flax seed oil, the richest plant source of Omega 3. It is also gluten free with no cholesterol. 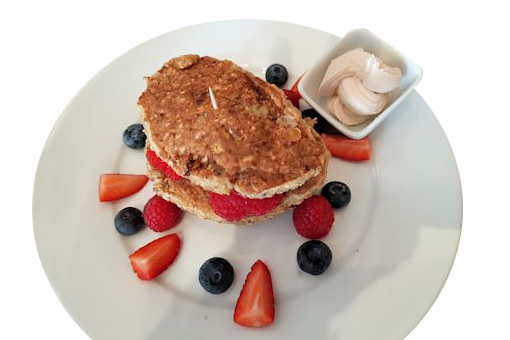 The flavour is creamy – something you could put on your breakfast cereal, add to beverages and drink on its own. You can also cook with it. It’s also soya free – a bonus if you have an intolerance to soya. Ray enjoyed his first cream elair in ten years on the JP Turner stand www.jpturnerfoodservice.com which was a real treat. This stand was pulling the crowds with its extensive array of mouth-watering dairy free cream cakes – unfortunately they weren’t gluten free so I couldn’t indulge myself. 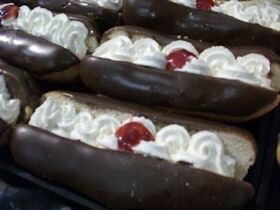 Neil Bairstow from JP Turner explained that the cream cakes were new this week “we finally got the recipe right for the soya whipping cream”, he said. Ray suggested that they should sell the cream separately as well, as it’s so difficult to find soya cream that can be used for whipping. For anyone following a dairy free diet, learning to live without cheese can be very difficult. In the past we’ve found dairy free cheese unappealing, but Vegusto’s range of dairy free cheeses are wonderful and well recommended, especially the No Moo Piquant variety. Vegusto www.vegusto.co.uk won the Fair trophy in the 2012 Free From Awards www.freefromfoodawards.co.uk and we can see why. It also offers the No Moo Sauce, the only nut free cheese in the vegan cheese range so it’s suitable if you have a nut allergy. It can be used on pizza, macaroni cheese and other pasta dishes. Or there’s No Moo Melty cheese, which can be used for cheese toasties and pizzas as it melts and spreads or cut into cubes and used in salads. Sam Rogers, director, Vegusto pointed out that the products are home made in Switzerland, are cholesterol free and 50% less fat than normal cheeses. 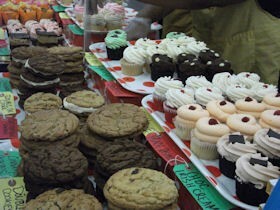 Pudology www.pudology.com was super busy with people sampling its delicious dairy and gluten free desserts. I sampled the new chocolate orange variety – wonderful! Also available in strawberry, banoffee and lemon, the puddings are now available in 32 Sainsbury’s stores as well as 23 Waitrose stores. “Four Girls And A Cupcake” www.fourgirlsandacupcake.co.uk is the intriguing name to a new gluten free and vegan cupcake business with a French twist started by Huguette Essome. Varieties include Apple Tartin, Fraise des Bois and Peanut Butter and Chocolate. Also on display were exquisite celebration cakes including a chocolate cake covered with summer berries. At The Honest Carrot stand www.thehonestcarrot.com we found a range of vegan crunchy falafels, sweet potato hummus, carrot burgers and Royal Greens, similar to veggie burgers, made of spinach, kale, leek and lentils with a garlic and ginger bite. 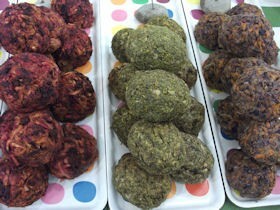 Or there were London Roasts – balls of beetroot, carrot, parsnip, potato and apple. The products are all gluten free and dairy free. Melissa Morgan, aka Ms Cupcake www.mscupcake.co.uk was busy signing her new cookbook “Ms Cupcake: The Naughtiest Vegan Cakes in Town”, but we couldn’t resist buying a couple of her flamboyant cupcakes – the gluten free banoffee and for Ray, the vegan Red Velvet.